Star Wars Auditions: May the Force be with you. Are you an aspiring actor or actress looking for your big break or do you claim to be the biggest Star Wars fan in the universe? 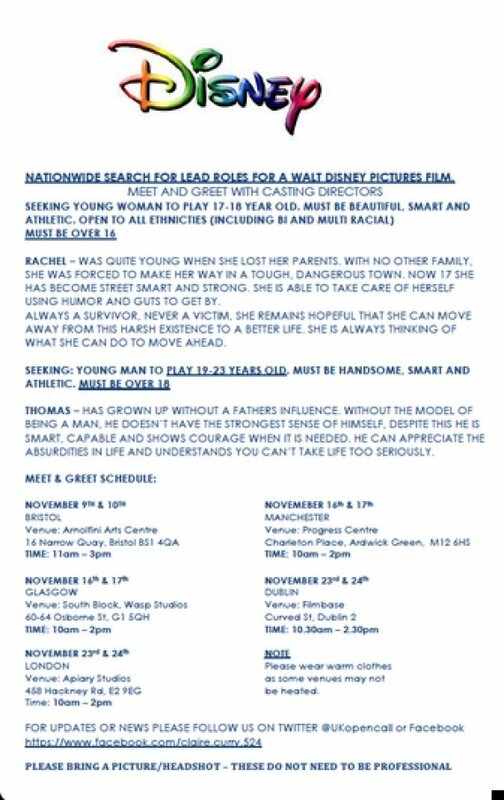 If you are either of these things you may have heard that Disney are hosting a meet and greet casting call to find two new leads for Star Wars Episode 7 which is expected to be released in early 2015. According to Disney they are looking for ‘a young woman to play 17-18 year old’ and they must be ‘beautiful, smart and athletic’ and a ‘young man to play 19-23 year old. Must be handsome, smart and athletic. Must be over 18’. So if you fancy yourself wielding a lightsaber or the next Princess Leia head down to the open auditions which are being held in London, Glasgow, Manchester and Dublin. The Star Wars auditions started looking for the two new leads on November the 9th at Bristol which saw almost four thousand people cowering under umbrellas in the rain for hours for their chance at the limelight. According to a few sources a few of the fans even decided to camp out on the Friday night for a chance to be first in line for the queue. Some fans were left disappointed when a security member announced over a megaphone that they were closing the queue at 10.30 as more than enough people had already turned up. If you are seriously considering about going to these auditions then it has been advised to queue for a couple of hours before the opening time. Even if you think the whole ordeal is rather cheesy or crazy it has given the opportunity for Star Wars fans to become a part of the franchise which would be an unbelievable experience for anyone. So, if like me, you want to jump at the opportunity and give it a chance head down to the most convenient audition spot. You never know, you may just spot me in the queue for the London auditions! For more details on the venues and times for the auditions then take a look at the photo above. Good luck and may the force be with you!